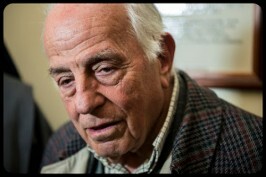 When he was 15, Piero Piperno found shelter in the Monastery of Santa Brigida in Rome. The Mother Superior, Mary Elizabeth Hesselblad, respected his Jewish religion. Today the monastery is a “House of Life”. If Piero Piperno is alive today it is thanks to a little sister who welcomed him into the convent in Rome. But the gratitude of this Jewish Holocaust survivor to that woman, sanctified today, is even more profound for another reason: at all times she respected his conscience and his religion. Piperno offered his testimony on January 15 during the “House of Life” award ceremony to the Monastery of the Order of the Most Holy Savior of St. Bridget (Santissimo Salvatore di Santa Brigida), Piazza Farnese, Rome, sponsored by the International Raoul Wallenberg Foundation. “This is your house,” said Mother Tekla Famiglietti, the current abbess of the order during the ceremony, to make people and the elderly guest feel at ease. “This was my house,” replied Mr. Piperno opening a window on the past, on the war, the darkness of evil and of good courage. In December 1943, in Rome, as well as in the rest of Europe, the Jews were being hunted by the Nazis. Two months earlier, on October 16, the SS had flooded the streets of the Portico d’Ottavia, in the ghetto, and raked 1024 people, including over 200 children. After the war, only fifteen men and a woman returned from Auschwitz concentration camp where they were taken to, and no one of the two hundred children. Roman Jews survivors hid where they could and as they could. 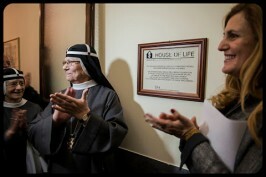 For the twelve members of the Piperno and Sed families, the fragile shield against the black hole of deportation were a little wooden door on the rear of the Church of Santa Brigida in Piazza Farnese, and the courage of a little nun, Mother Mary Elizabeth Hesselblad. The Mother Superior of the order of the Most Holy Savior of Saint Bridget, canonized in 2000 and acknowledged as a “Righteous Among the Nations” in 2004, opened the doors of the monastery to the fugitives and sheltered them, together with her sisters, until June 4, 1944, when Rome was liberated. It took, in fact, until the Second Vatican Council to overcome the barrier between Catholics and Jews. “This place has been a guiding light in the darkness of the Shoah” said Silvia Costantini, Vice President of the Wallenberg Foundation for Italy and Director of Communications and Institutional Relations of Aleteia. The ceremony was attended by the Ambassador of Sweden in Italy, Ruth Jacoby, Israeli diplomatic representatives, members of Jewish institutions, and Mr. Leo Paserman President of the Museum of the Shoah Foundation, and former President of Rome Jewish Community. “Research and education are the two poles of activity of the International Raoul Wallenberg Foundation, trying to uncover untold stories of rescuers and striving to instill in the hearts and minds of the younger generation the spirit of civic solidarity”, Vice President Costantini said. It is significant that the International Raoul Wallenberg Foundation, founded by Baruch Tenembaum and directed by Eduardo Eurnekian, counts among its first members former Archbishop of Buenos Aires Jorge Mario Bergoglio, now Pope Francis. Casa Santa Brigida overlooks Piazza Farnese, in silent dialogue with the Renaissance Palazzo Farnese, the site of the French Embassy in Italy since 1936. A few days ago many Romans came here to show their solidarity after the massacre at the headquarters of the satirical magazine “Charlie Hebdo” and kosher supermarket in Paris. Piperno reads the simple plaque designed by the Raoul Wallenberg Foundation defining from now on Casa Santa Brigida as a “House of Life” and reflects: “In those days there was a lot of solidarity among people. After Rome was liberated and we were able to return to business, our women went back for grocery shopping at Campo dei Fiori market place. People greeted them and said “We knew that you were hidden by the nuns “. They knew, but they had not denounced; in those days it was the difference between life and death. This is why, at some point, Piperno and his wife has decided to reverse the order of their memories. “We always spoke of those who were gone, those who had not returned because of those who had denounced. And then we decided to change and to remember the good people, those who have helped us, those who risked their lives to save us”. 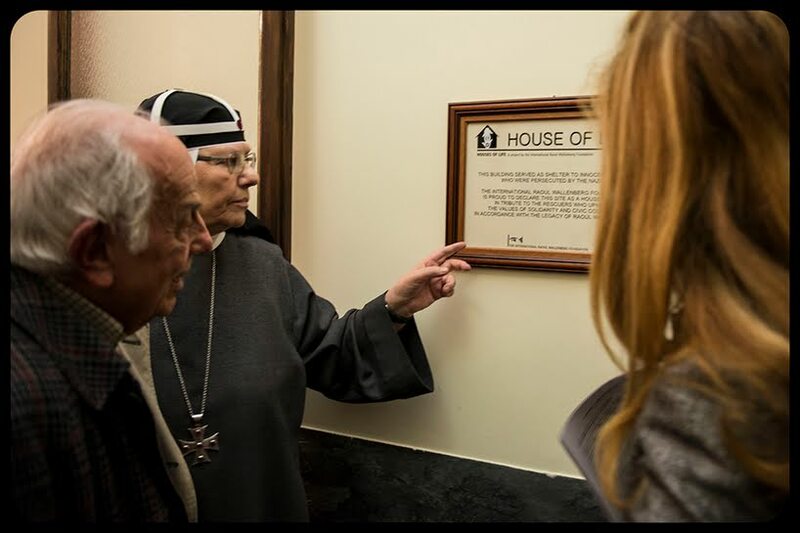 “Today, like yesterday – he concludes – we must rally around the good to prevent the evil to overwhelm us.” And even a plaque can serve this purpose.